Here’s a fun one for you coffee lovers, from an author who loves the drink as thou, and who tells of coffee’s magick and folklore. Where in the world better than here in Seattle to be well informed on coffee? If you’re captivated by its essence, you’re likely to be by the anecdotal history of coffee presented here as well. Did you know King Solomon is said to have healed the sick with coffee, and that myth portends he was given the medicinal hint by Archangel Gabriel? Beyond the legends, the book guides us briefly through the written history, including the religious scandals wherein coffee was associated with alcohol and the devil. When Pope Clement VIII was being persuaded by numbers of priests to condemn this devil’s trick, we’re told his reaction after taking a sip: "Why, this Satan’s drink is so delicious that it would be a pity to let the infidels have exclusive use of it. We shall fool Satan by baptizing it and making it a truly Christian beverage." But enough of history alone — Ms. Posey passes little time before introducing us to whispers of Freemasonry, the Golden Dawn, Jungian psychology, Eastern mysticism, and more. She is bringing up the topic of magick in general before swigging her cuppa joe and divining for us. My appreciation for her approach is that she doesn’t make coffee magick out to be something it is not; no claims to an ancient practice, no pointing to dramatic miracles. Instead, as she says in her introduction, forms of divination "bypass overly logic-driven thought to reach deeper instincts. The medium you use as your psychic tuning fork should always be something that resonates within you." So again I say, where better than in Seattle? If that aroma, that hearty cup some time in your day draws out something deep, something that inspires so many into philosophical conversation, why not focus that inspiration toward higher goals? Posey offers her thoughts on reading fortunes in cups of coffee — or, as she points out, reading the present to empower one’s future — as well as scrying and brewing potions. Potions? Yeah, that’s what she calls them, and they’re tasty recipes to boot. But potions here means using coffee in ceremony to generate intent, to focus efforts toward a particular goal, and maybe that’s just what potions are anyway. In any case, all of Posey’s magick seems to be about empowering the individual, which seems a worthwhile pursuit. 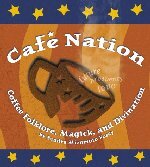 The final chapter even offers a "Café Nation System" of divination, but she pretends no exclusive truth; rather, she points a way to peek inside and give an ear to that master living there. So if coffee be a push for you toward that inner voice, you might give Café Nation a try.